We have spent one week gestating in the ritual womb-space of the STAG, walking into the local outdoor Strathcona labyrinth, the STAG labyrinth, working with sounding practices, sharing life stories, emergent movement, and documenting our artworkings throughout. Throughout the residency we have consciously engaged our artworkings within public and private space. We began our residency with a public sharing/artist talk of our Womb Walks project, labyrinth walks collectively taken in our separate geographic locations on each of our birthdays during the past six months. This evening we close our residency with a public performance ritual and artist talk. Coming down to earth and into our bodies through these collective practices we uncovered and re-covered the performance of and need for rest. Entering collective rest and “naps,” we incubated our dreams, visions and intuition, healing and rooting ourselves back to the M/Other through inner sight/in-sight. The Gestare Pillows were made by the collective to enhance and welcome our dreams through night time sleep and day time naps with mugwort, the herb of dream incubation. We shared our dream experiences while stitching and sewing the pillows throughout the week for community/others. 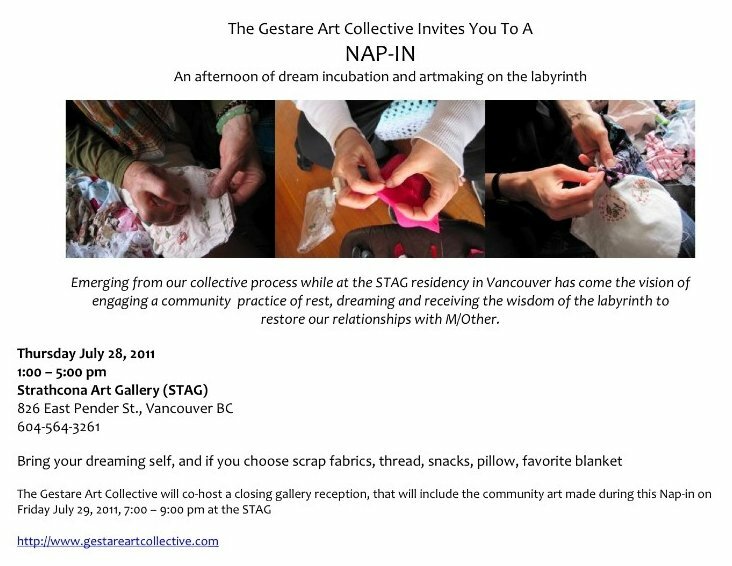 From this Gestare practice, we co-facilitated a group “Nap-in” with community/others during our week of gestation. Sharing a group Nap-In and incubating together, we shared rest and dreaming. Upon waking from napping we made, wrote and stitched a scroll of our dreams. We closed our afternoon Nap-in by installing the Gestare Dream Scroll. 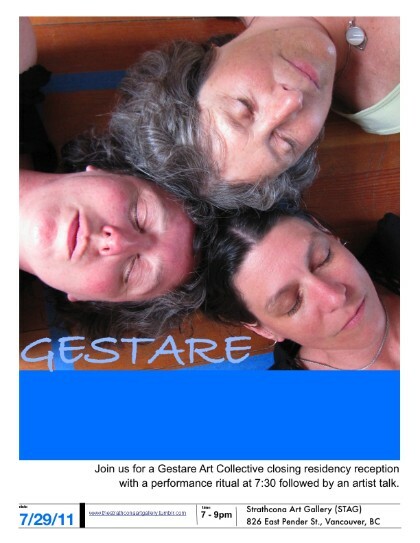 The performance ritual this evening is a public sharing of the closing of the Gestare Art Collective’s residency. Within this twelve minute public performance ritual we rest, sound, dream, and walk out of the labyrinth, returning the dream blanket supplied by the STAG residency to a place of rest, bringing our residency to a place of completion. We are grateful to the women who participated in our opening Womb Walks sharing. We hold close to our hearts the dreamers who answered the call to our Nap-In; Aja Bond, Cindy Lou Griffith and Valerie Lys and send many thanks to each of them for their contribution to the birthing of the Dream Scroll. 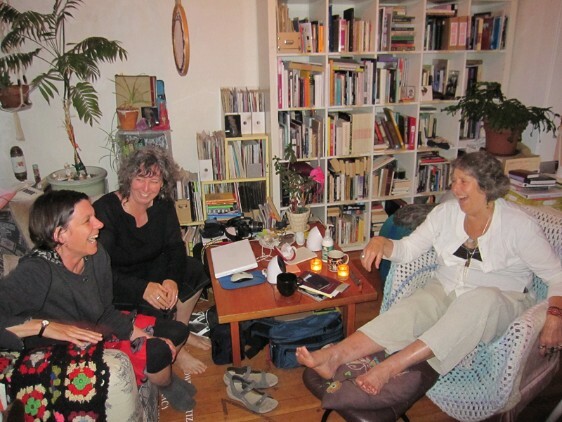 And we share a deep gratitude for the stewards of the STAG Residency, Aja Bond and Gabriel Mindell who have held the space of our artworkings with sensitivity, respect and love. Our time of gestation here has been a precious gift that we have only explored the tip of. We look forward to the births that await us. Our labyrinth practice offered re-storation and re-emergence of our re-lationship with the M/Other as our daily naps called up the wisdom of dreamtime. Practising the ancient art of stitching we worked with threads and strings through textile, beads and ribbons. Working in circle, sharing stories of our dreamtime naps and nights as Gestare dream pillows emerged from our collective handworkings. Mugwort incubates and lucidates our dreams, while scent of lavender soothes our breath to sleep. Capturing the messages from the dreamtime we wrote and ripped and stitched and hung our dreamscroll banner. Our incubation complete, our final rest in wombspace lifted us to kiss the birthing of our next gestation.